This morning, I noticed that Prime.com had transferred domain registrars. The domain name moved from Fabulous to the corporate brand protection company, MarkMonitor. 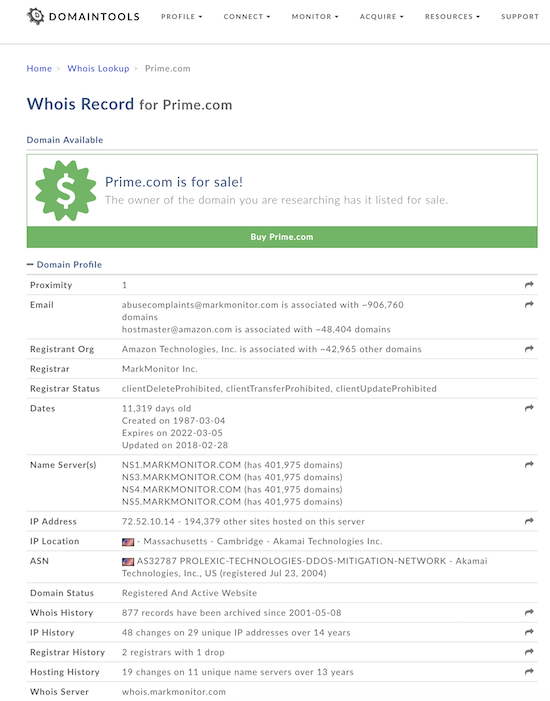 Prime.com remained under Whois privacy and the domain name did not resolve to any website at the time I published my article about the transfer. The acquisition of Prime.com was a very smart move for Amazon. For the past several years, Amazon has been promoting its Prime brand quite heavily. As a Prime member, our Amazon boxes come delivered with Amazon Prime promoted on the tape and packaging. Amazon has built Prime into its own brand, but like the Amazon brand, the Prime branding is pretty generic. With Amazon’s acquisition of Whole Foods, the Prime brand is extending beyond Amazon. Prime members can get certain benefits when they shop at Whole Foods. I would not be surprised to see these benefits extend even further as Amazon makes subsequent acquisitions or partnerships. Prime could conceivably become a standalone extension of Amazon’s brand. Prime is certainly an Amazon brand above all else, but Prime is a known entity in and of itself. This likely made owning Prime.com more of a priority, and with Amazon’s massive revenues, an acquisition was pretty much a drop in the bucket for the company. I would only be making a guess on this, but I think Prime.com was a mid seven figure or possibly an eight figure acquisition for Amazon. Prime.com is a truly generic domain name, and there are quite a few big companies with Prime in their branding that could have also wanted to buy the domain name. As I mentioned last year, Prime.com was listed in the Moniker/SnapNames domain name auction in 2011, and it had a reserve price range of between $1 million – $5 million. Since then, Amazon Prime has taken off and likely increased the value of the Prime.com domain name. Great find earlier and reporting Elliott. What other domains should AMZN should be on the lookout? AMZN sending loud and clear message. Couldve purchased this domain yrs ago. Would be surprised if it wasnt 8 figures, peanuts to them. Big tech has trillions in their coffers, new Gs as brands didnt take off, and now they need to pay up for prime real estate in 2018. Is there a way to know the sale price? If they report it in a SEC filing, but it probably wouldnt be substantial enough to warrant that. I heard there was a bidding war with Optimus Prime and the final price was really 10 figures. No, obviously that’s a joke – Amazon may be big, but nobody could outbid Optimus Prime. Funny thing is that the domain prime.com is still available for sale at SEDO, when you search for the word prime at their website. For what it’s worth, around a year ago it had a $5M buy it now. Uniregistry lander. Great job Elliot ! As always . One question : Why wouldnt Amazon take the UDRP route to acquire the name ? Because it’s a pure dictionary word with many uses and Amazon doesn’t own the term exclusively. Hopefully we’ll find out how much they spent on it, when they file their financial statements. And because like any rational people no matter how big a corporate giant, they feared Optimus Prime possibly getting involved if they did that. For the price they paid I’m sure they could have purchased the single word “prime” in every new GTLD and country code available; but I guess that did not matter to them? Shocker.